Arnold passed on today after battling cancer for more than a year. 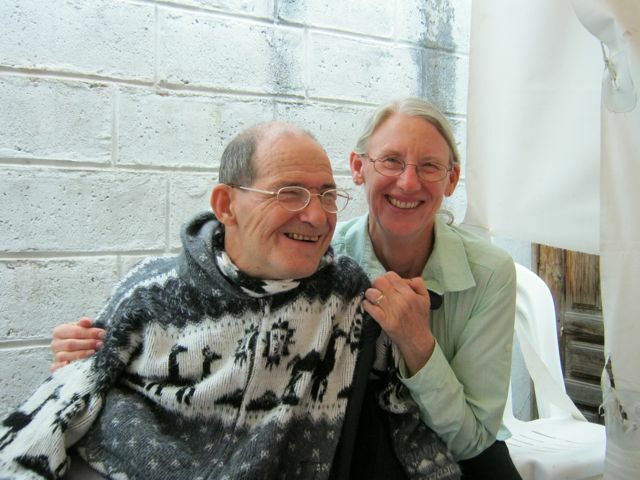 Arnold was the nephew of Blanca Puma, Program Director of FEDICE here in Ecuador. He was also the son to Blanca that she never had. Arnold will be missed enormously. If you know Blanca, or even if you don't, please send her a note of support at blancapuma@hotmail.com. The last time we saw Arnold was April 25th, a mere two months ago. He was 21 years old. At that time, he had completed his 14th and last chemotherapy treatment. The cancer appeared to have been eradicated and he was looking forward to resuming his young life. A week or two later, a blockage appeared in his intestines. As is so often the case, the cancer manifested itself in another place, as if to tauntingly say, "You really didn't think you could destroy me, did you?" The amazing thing about Arnold was all that he accomplished during his short life. With his father serving as training partner, he became one of Ecuador's elite runners. That day in April that we visited him and his father in their tiny Quito apartment, we were treated to countless photographs, trophies, and other mementos from his races. He gave me one of the jerseys he had worn in a race. Arnold learned English well enough to teach it to others formally. Marilyn and I were impressed with the command of the English language he possessed. Most importantly, Arnold didn't give into his battle with cancer. To him, it gave yet another opportunity. Whenever he was well enough, he visited other cancer patients in the hospital to offer words of encouragement and hope. That took not only strength of character, but heart and spirituality. It's sad when anyone dies of cancer. We have a longtime friend in Houston who may be approaching that outcome, and we grieve for him. Somehow, though, even with all Arnold has accomplished, it seems sadder for him to be taken in his twenties rather than his seventies. "Dear FRIENDS With tears in my eyes ... this morning Arnold passed away Blanca is heartbroken...I'll do my best to comfort her he is our angel looking over to all of us thank you so much for your prayers & support GOD BLESS YOU LOVE Luis & Blanca". I like the thought of Arnold as angel, yet another role for him to take on with gusto. That is more comforting than anything I could think of. Glenn, I'm sorry for the loss of this nice young man. Thank you for telling about him. Un abrazo. Thank you, Glenn. I didn´t know Arnold personally, but was so impressed at the funeral with what everyone had to say about him. I would have liked to have met him. It was good to see you and Marilyn and Isabelle at the funeral. We´ll see you in a couple of weeks. We are sorry to hear about Arnold. He was so young and had a promising future. Keep up the good work in Ecuador.